Don’t mess with Ohio, people! Dodger Stadium Express info for those who want to avoid the driving/parking thing. Things to read while sitting/standing/stuck on transit: Fun piece in the NYT on genetic testing that seemingly proves Warren Harding had a rich and fruitful extracurricular life. Question: does anyone know if the White House closet mentioned in the article still exists? Wait! I should tweet the White House! Answer: The info that Google needs is provided to them by Metro once the line is open to the public. And Happy World Lizard Day! 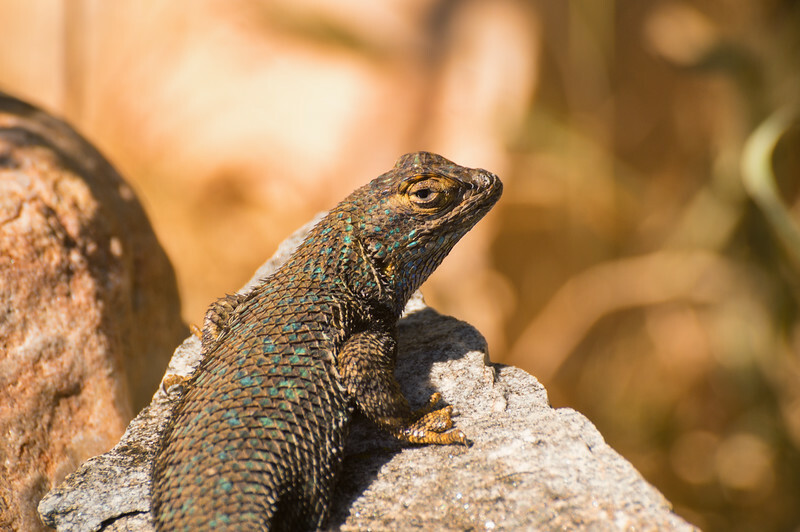 If you can manage to get a photo of a lizard on/at a Metro facility today, tweet us and I’ll declare you the greatest transit rider in world history on the blog next week! Residents complain the protected bike lane would cost them too much parking in this residential neighborhood near the South Pas Gold Line station. FWIW, a lot of the homes there already have driveways. And there’s another obstacle to bike lanes in our region. I think there is plenty of room on some streets for things such as protected bike lanes — if you’re willing to sacrifice a parking lane. But asking residents to sacrifice parking — even when they already have it on their property — is often too steep an ask for cities and pols. #Sigh. FWIW2: If the parking lane was sacrificed on Allen Avenue in Pasadena, a really nice bike lane could be constructed between the Gold Line’s Allen Station and the Huntington Library. A look at the beginning of work on the bridge that will carry the Crenshaw/LAX bridge over the 405 freeway. I like it when Metro Rail or Metrolink can be seen from the freeway — a nice reminder to motorists stuck in traffic that there may be a transit alternative that works for them. The Gold Line runs along a chronically constipated section of the 210 — and will traverse the eastbound lanes on an awesome bridge in Arcadia. Expo 2 runs adjacent to the 10 freeway for about a mile east of Culver City with Expo 1 crossing a traffic-gripped part of the 110 south of DTLA. The Green Line, of course, runs down the middle of almost the entire length of the 105 freeway and the existing Gold Line crosses the 710 in East L.A., the 5 just east of the L.A. River and the 110 three times. The South Coast Air Quality Management District said that the environmental document for the SR-710 North Study didn’t adequately analyze carbon monoxide and air particle levels that would result from the freeway tunnel alternative and didn’t properly analyze cancer risks. The study was prepared by Caltrans with funding from Metro, via Measure R. The SCAQMD letter is being discussed today on AirTalk on KPCC. A company is proposing privately-financed solar-powered pods to whisk people around and they persuaded at least one pol to listen, which in Beantown is probably not a heavy lift. Never mind that it looks like an amusement park ride and doesn’t have much capacity. As for the Globe headline writer, he/she must never have watched the Jetsons in which the flying cars — not pods — did not require being hooked up to big metal rails. Correction/Clarification please, Boston Globe! 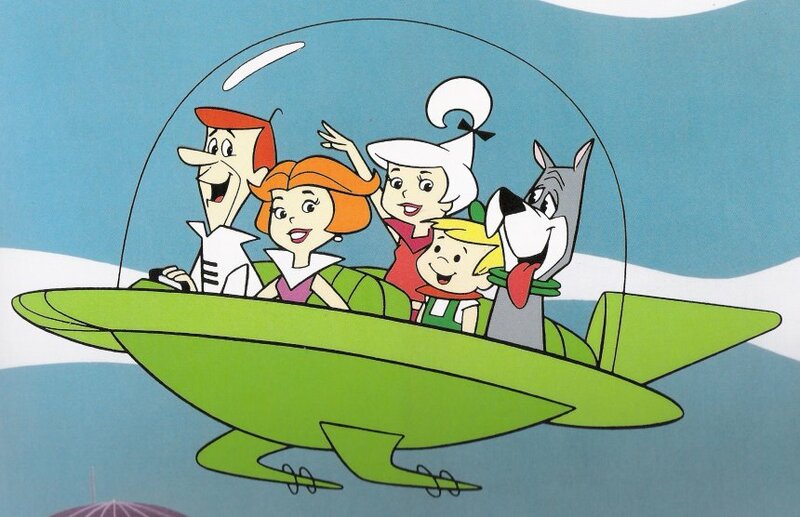 As for the Jetsons car, if it can be outfitted with a couple of kayak racks and there’s zero financing available and free fin changes for the first 100,000 miles, I’ll take one. And before there was hip-hop, there was James Brown…have a great weekend! I think you could drop the first comma of the first sentence. Ohio people are crazy. 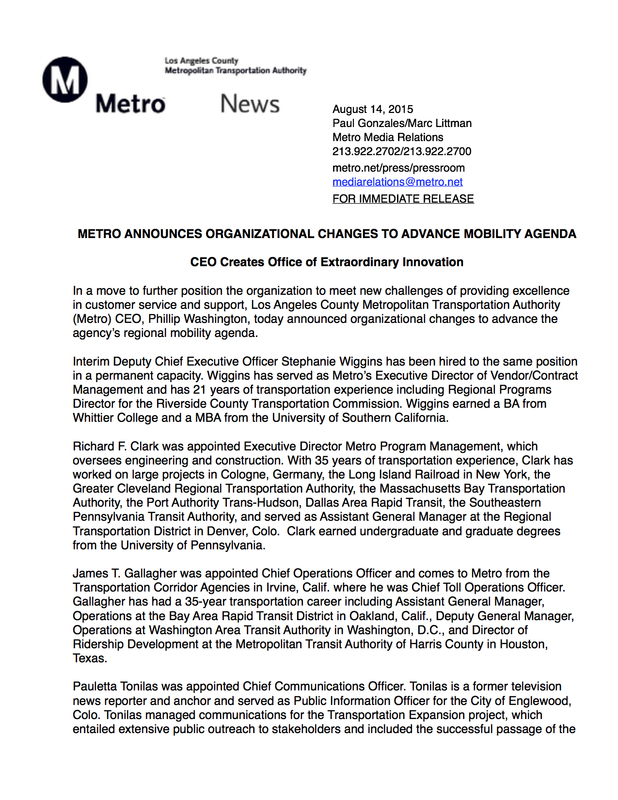 The new COO of Metro certainly has the valuable credentials to be an asset to Metro. Transportation Corridor Agencies (The Toll Roads) experience will be valuable input for operating Metro ExpressLanes and finding new places where the ExpressLanes can be expanded. Experiences in both BART and DC Metro will give valuable insight on how to better reduce fare evasion with more turnstiles and gates, how to tie in TAP cards to work with Metrolink (i.e. how Clipper Cards are capable to use both flat rate MUNI with distance based BART and Caltrain) and perhaps studying the potential move of at least Metro Rail to distance based fares. Is it too late to propose a minor design change to the Crenshaw line bridge over the 405? How bout routing that elevated train track right through the world famous Randy’s Doughnut? Love the 2 Lada Laikas in the mid-ground, originally based on the Fiat 124 design although these pictured are closer to the Fiat 131. These cars were made in Togliatti, USSR, a city named for the head of the Italian Communist Party in honor of the Fiat (now Fiat Chrysler Auto, ironically the parent of Jeep and Ram Truck) assistance to get the Lada factory set up. In the background we see what appears to be an Hungarian Ikarus bus, made by the same company who together with Crown Bus sold the first articulates to SCRTD and later evolved into NABI, maker of the majority of the current Metro Los Angeles bus fleet. Unknown fact: the biggest car importer to Cuba today is actually China.